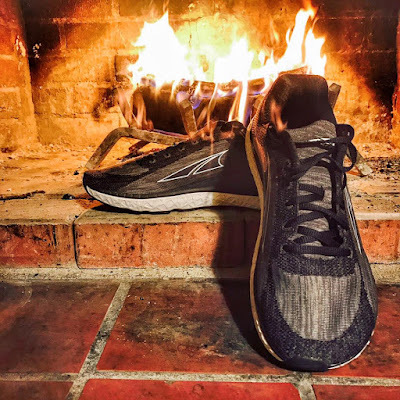 Road Trail Run: In Depth Altra Running Escalante Review:Fire! Editor's Note: We are thrilled to offer this joint, in depth review of the Altra Running Escalante road running shoe. Patrick Caron is a 19 year old Boston area Altra Ambassador who set the New England ultra scene on fire in 2016 with 14:51 100 mile and 6:14 50 mile victories among several others. No slouch on the road he was the top 20 and under finisher at the 2016 Boston Marathon, 2:46. He averages over 100 miles per week of road and trail running, mostly in the Altra One. Patrick works in a running speciality store so he sees and fits lots of shoes. Peter Stuart is a frequent contributor to Road Trail Run focusing on performance trainers and racing shoes. He is a masters runner on the "late side" of the 40-49 age group. One of the strongest masters in the Los Angeles area he has a recent sub 3 hour marathon and a 1:21 half marathon. The Escalante has a catalog weight of 8.2 oz/232 g men's size 9, 6.5 oz/182 g women's 8. Sam's size 9 beats the catalog weighing in at 8 oz. The stack height is 25mm heel/25mm forefoot so the same stack height as the Instinct/Intuition. All Altras are Zero Drop from heel to toe. The Foot Shaped toe box is of course on board with the last following that of the Torin 2.5 and Superior trail shoe. It is intended to fit in the Altra line between the Instinct and Torin. Retail $130. Available now in Men's and Women's styles and Fit4Her gender specific women's fits from Altra here, at other retailers at bottom of the article and at your local running store. Patrick: My first impressions of the Altra Escalante is that this is one slipper-like shoe! With an eye-catching appearance and a soft, smooth feel on the foot, I was eager to test these out, even if we just got dumped with 20+ inches of snow here in New England! Patrick: The overall fit of the Altra Escalante is terrific. 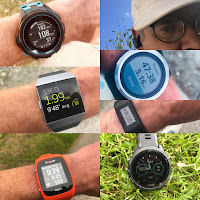 Having received a pair in a men’s size 9, I would have prefered an 8.5, which is the same size I wear in the Altra One 2.5, my go-to shoe and the shoe I often use as a baseline for comparison. Altra recommends to go half a size up from your normal size in the One 2.5, so I would assume it makes sense for one to do the same in the Escalante. According to several friends who have worn a wide variety of Altras, they have found the sizing comparable to the Superior 3, the Torin 2.5, and the Lone Peak 3 (three of Altra’s most popular models). The upper of the Altra Escalante is fantastic as well - fully engineered knit uppers seem to be all the rage these days, and Altra already seems to have mastered this in their first shoe to include this feature. The closely-knit material holds snug to the midfoot while maintaining the toe-room that Altra’s have come to be known for, although it is much more of a sock-like fit than other Altras I have worn. The upper really hugs the foot nicely all over, but never feels constricted in any way. The upper is similar in many ways to a Nike Flyknit, although much softer and overall is more comfortable. It’s a fairly thick material, and with a snow-filled winter in New England this year, it’s been providing some extra warmth, although I’m not sure how that will carry over in the warmer months. The toe box is soft and minimally structured with some stretch. The dark knit up front is not significantly firmer and appears to be only for some wear protection. One might wonder if the foot is well held with such an unstructured front of the shoe. It is and superbly so as at mid foot, on the inside are two approximately 2" long fairly substantial overlays applied to the inside on both the lateral and medial sides. Peter: I would say half-size up for sure! I'm half-size up in Instinct too. I haven't found them to be any warmer than other shoes, they've been nice and cozy in lots of rain. I do find the fit a little bit sloppy. Took a minute to get the heel locked down, and there's a bunch of room in the forefoot. Overall they're a decent fitting shoe and the materials are good. I wish there was just a hair of padding in the tongue as I have to lock down the laces pretty tight to get the heel locked. Patrick: The newly introduced Altra EGO midsole is the real big news with the Altra Escalante. Currently, the Altra EGO midsole is only in two Altras, the Escalante and the recently released King MT (a more rugged trail and OCR shoe). As Altra describes it on their website, “by using a secret blend of compounds, Altra EGO offers the holy grail of running shoe cushioning, comfortable and soft, yet lively and resilient. With increased responsiveness and thinner cushioning, Altra EGO combines a closer to ground feel with the comfort of a plush ride.” Sure, there are a lot of catchy words within that summary, but they all held true when it came time to test them! With a stack height of 25mm (being zero-drop, it’s 25mm in both the heel and toe), the Escalante falls in-between the One 2.5 (23mm stack height) and the Torin 2.5 (28mm stack height). The new order of cushioning from least to greatest in Altras neutral lineup is now the One, the Escalante, the Intuition, the Torin, and then the Paradigm. I personally feel like the Escalante is up there in cushion with the Torin, although with a much livelier feel, great if you’re looking to pick up the pace or just have a little extra spring in your step. Also, by having a lower stack height than the Torin, the Escalante has a similar amount of flexibility to the One, with a bit more cushion all around. Sam: The heavy magic is in the midsole outsole combination. Escalante features Altra's new EGO midsole. EGO is not pure EVA or even from what I can tell a minor blending of EVA and rubber or other compounds. 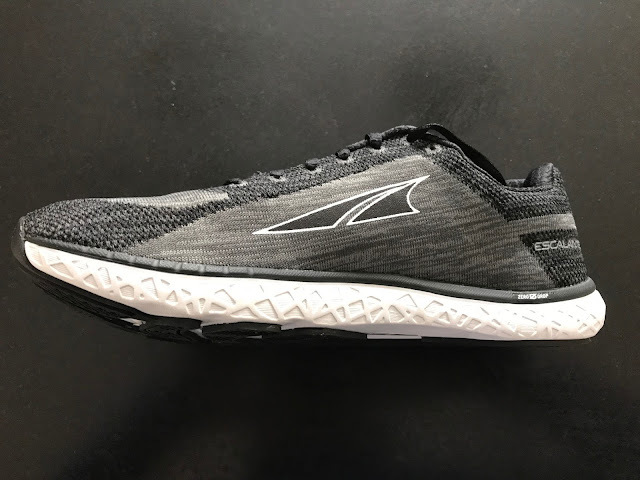 In a clue it is Altra says it is designed to perform "better and more consistently in extreme temperatures" and "have long term durability to maintain excellent cushioning and energy return properties". This sounds a lot like the claims made for adidas Boost and Saucony Everun TPU based midsoles. In terms of softness to touch the Escalante seems a touch softer than Boost and about the same as Everun but as the Boost "popcorn" of expanded TPU are larger the cushioning feels about the same as Boost and a bit softer than Everun. It is definitely softer to the touch than the RMAT in the Hoka Hupana, my 2016 shoe of the year. On the run the midsole is certainly soft, and comfortable without being energy sapping, bottoming out or mushy. It is very lively in a comfortable way. Patrick: The outsole of the Altra Escalante features the company’s FootPod Outsole, which “follows the natural construction of the human foot for maximum flexibility and a responsive ride.” There is a lot more black, durable rubber on the Escalante than the One 2.5, and this helps protect the Altra EGO midsole from breaking down quicker over time. It also gives the shoe more grip and traction when the conditions get rough. Also, unlike the One 2.5, which can pick up pieces of gravel on occasion in-between the different sections of the outsole, the Escalante does not have this issue. Sam: The Escalante outsole is dense, firm rubber arranged in a what looks and feels like it is in a stride and wear dynamics correct layout and one that due to its coverage, thickness, and firmness one that does an excellent job stabilizing the soft EGO. I find Escalante more stable than Freedom ISO from Saucony and so far as stable as say a Boston 6, maybe more stable. 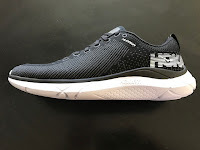 The rebound is more lively and energetic (don't forget the outsole) than Everrun, Boost or Skechers 5GEN and the feel a bit softer but a touch less smooth than the RMAT in the new Hoka Hupana which relies 100% on a single slab for cushion, stability, and wear. It is somewhat less responsive but should be for me more comfortable under foot for daily miles than the new Skechers GOmeb Razor. In terms of cushion the forefoot cushion and easy flex is just the way I like it. 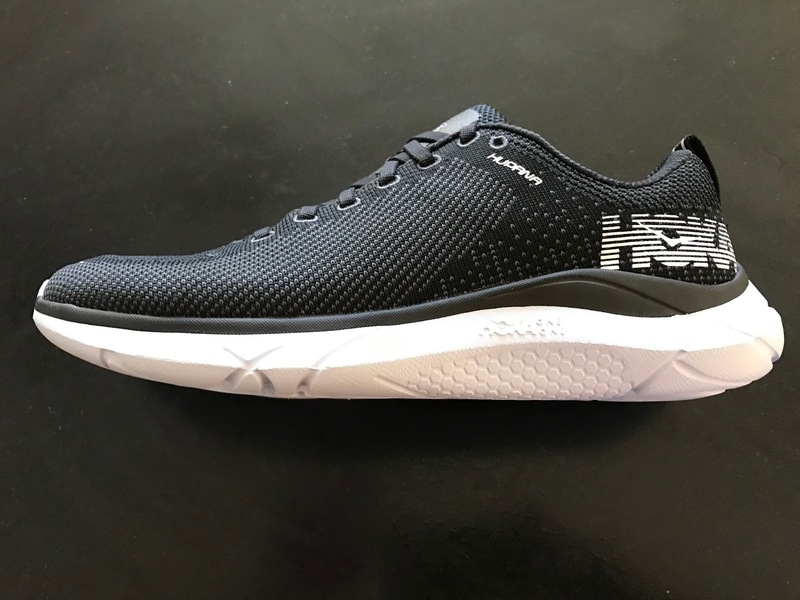 25mm of EGO up front getting into the super cush range of maximal shoes such as Hoka but... here it is flexible and lively as Altra uses Inner Flex grooves in the midsole and wide spacing of the quite full coverage, stabilizing outsole rubber. The forefoot ride and feel is livelier for sure than the Torin maybe not quite as snappy as the Impulse but more comfortable. Peter: I agree that the shoe is soft. For me it is right on the verge of bottoming out. I've had a strange experience nearly every run (5 so far) in this shoe. When I start out I think "Wow, these are too soft and they're about to bottom out, ugh". By the end of every one of those runs I've thought "Hmm, these feel smooth, light and fast". Patrick: The ride of the Altra Escalante is a unique one. Having already put plenty of miles into this shoe, I feel like I could go forever in it. It’s light enough that I don’t feel much of anything on my foot, and the cushion to weight ratio is extremely high. The Altra EGO midsole is very soft and spongy, although it maintains enough firmness and pop to help increase turnover and speed. I’ve also been impressed by the grip of the shoe, especially with the roads around me being a mess lately due to a couple of recent snowstorms. If I had to choose, I prefer the Altra One 2.5’s ride in general, although much of that has to do with the fact that I generally wear very minimal, lightweight shoes for all my runs and races (whether it’s road or trail). That being said, I think the majority of people will prefer the Escalante, and I think this shoe is a huge step forward for Altra, as it’ll appeal to many runners today due to its remarkable performance as well as its sleek, stylish look. Peter: The ride of the Escalante is interesting. As I said above there are times I feel it's too soft and on the verge of bottoming out, and other times that I feel it's just right. Overall it's a smooth, flexible and pretty enjoyable ride. There is a good amount of cushioning and very little forefoot fatigue. The standout of the ride for me has been the grip of the shoe in wet conditions. The rubber on the bottom of the shoe grips every wet surface I've hit like an Iguana. On the down-side, I really notice the strain on my calf muscles in this shoe. It's definitely zero drop. Sam: I have only run once in the Escalante, 7 miles at a slower tempo pace for me of 8:48/mile, Then I sent them on to Patrick. As described in the marketing, the first run was fast and springy especially in the forefoot, more springy and fluid than Freedom ISO with less of a sense of bottoming out and then some heel instability and we are talking a zero drop shoe for the Escalante and not a 4mm drop as for the Freedom ISO. 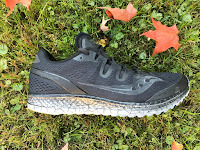 I really think the firm outsole rubber under soft EGO helps pull together the ride and deliver the "fast and springy, yet comfortable and soft" in the shoe. It is also a more flexible shoe than Freedom and Boston 6 and certainly the Hupana. At a very light 8 oz for a 25mm stack of cushion the Escalante also challenges the Hoka Hupana, Clayton and Clifton along with the Skechers Performance GOrun 5 and GOmeb Razor and Saucony Kinvara in the low weight to overall stack or Sam's Ratio-adding forefoot and heel stack and dividing by weight. As Escalante is a Zero Drop shoe there is for sure some sense for me as a heel striker with poor form of "missing the heel". I miss the heel a bit more than in the Torin 2.5 which has 3mm more foam all around in the midsole, about equivalent to the Altra Impulse (my 2015 shoe of the year) with its firmer foam and 2mm less heel height. As I always say when writing about Altra... I wish they included "training heels". I cut the rear of an old sockliner into a 2" section and put under the supplied sockliner but didn't do so for my first test run in the Escalante and everything felt fine. If you are not used to Altra Zero Drop geometry it is recommended to start with low mileage and moderate paces to get your legs and feet conditioned to t zero drop. For some runners like me, the zero drop is no issue in terms of soreness or injuries, for others it takes some getting used to. As I did with the Impulse I would not hesitate to run a half marathon in the Escalante and I ran some fast, for old me, halves in the Impulse. Patrick: As a friend of mine put it, the Altra Escalante is like the dark horse of shoes - “ a candidate or competitor about whom little is known but who unexpectedly wins or succeeds!” Having worked in running speciality for the last year and a half, I’m really excited about the potential of this shoe, and can see it rivaling many of the top shoes on the market today. Peter: Overall I really like the Escalante. It wouldn't necessarily be my top shoe of the year, but it's a solid offering from Altra and definitely my favorite Altra so far. Sam: The Escalante takes Altra into new directions. The knit upper execution, foothold and comfort is excellent. 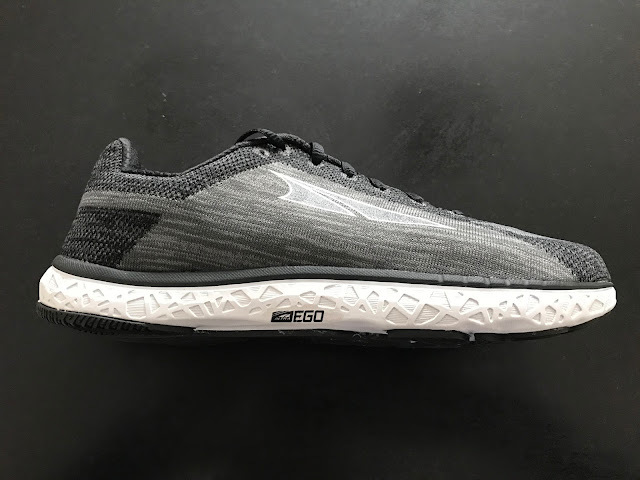 The new EGO midsole and outsole combination does, in my view, move Altra towards that "holy grail" combination of fast, springy, comfort, and soft in a big way. Peter: Both of these shoes are in the 'barely there', flexible light and simple shoes. Running in them side-by-side shows the Escalante to be MUCH softer and more protective than the One. It's a little more shoe and I'd be way more likely to take the Escalante out for a bunch of miles. Patrick:As I stated earlier, the One 2.5 is my go-to shoe, from everyday training to race day. The Escalante is designed to be a more cushioned, yet more responsive version of the One 2.5, with a similar lightweight feel. It is noticeably more cushioned than the One 2.5, and its springiness helps aid you in the later miles of a run, whereas the One 2.5 has a totally natural feel to me, as if you are not wearing a shoe at all. The Escalante will certainly prove to be more durable and hold up better over time, especially since it has more outsole coverage than the One 2.5 (although expect more outsole coverage in the One 3, which is being released in May 2017). Sam: The Hupana has a snugger upper all over for sure. 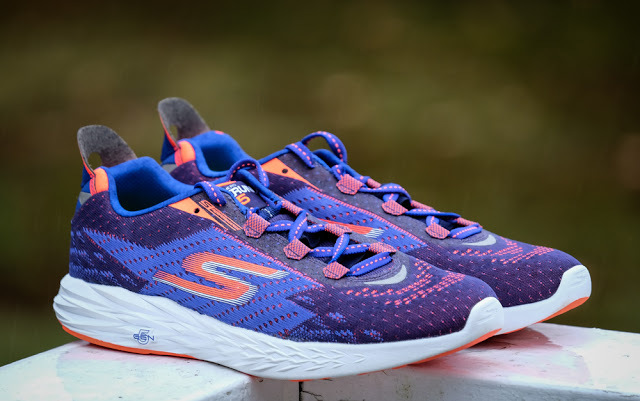 It's ride feels more cushioned at the heel at all paces despite having the same stack there as the Escalante and no firm rubber with about the same cushion but lower stack but stiffer flexing in the front. The Escalante is more dynamic in its cushion, quicker to compress under load and quicker to return while the Hupana has an overall smoother feel with a more gradual compression and return. Hupana may more versatile as a daily trainer and up tempo runner as its ride feels about the same at all paces while Escalante leans towards the race and up tempo side and is wider fitting. Peter: Very different shoes. The Escalante is like the lighter, more flexible little brother of the Instinct. Sizing and fit are very similar, with far less material on the Escalante. The Escalante seems like a no-brainer here if you want to go a little faster. The instinct if you want pure cush. Peter: These are VERY similar shoes, executed quite differently. They both feel soft, they're both pretty flexible and they both work for slow and fast miles. That said, I prefer the GoRun. For me the GoRun transitions better, is quicker off the toe and is overall a better fit. While I've felt like I may be bottoming out in older versions of the GORun the 5 has been a great improvement. Patrick: The Escalante is a lighter, more flexible shoe than the Freedom, with a slightly softer feel underfoot and a more fluid transition during foot strike and toe off. The Freedom has a bit more snap to it though, and has the extra 4mm of heel for someone who might not yet feel ready for a zero-drop shoe. Also of note is the fact that the Escalante has a price tag of $130 as opposed to $160 like the Freedoms, and for two shoes that are very similar, this can make all the difference. Peter: Escalante and the Freedom are also similar in many ways. They are both light and flexible. I mostly prefer the Freedom, except for one major issue. Over 8 miles the Freedom tends to leave me with a fatigued forefoot. The Escalante certainly protects the forefoot more, but it's fit and ride are a bit sloppier. Sam: While the Freedom is fast and easy to run it has a soft somewhat unstructured heel when compared to the Escalante. Up front Freedom is stiffer and not as easy to transition for me. For easy going fun the Freedom, for moving things along the Escalante. The Altra Escalante was supplied at no charge. The opinions herein are entirely the authors'. Click Here RTR's Latest Running Shoe and Gear Reviews, over 65 in 2016 and 20 in 2017! 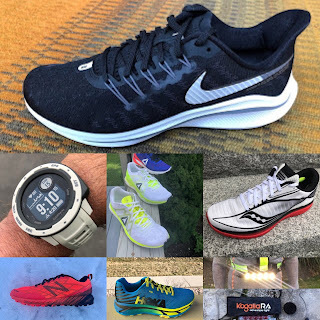 Click Here RTR's 2017 Run Shoe Previews, 14 brands so far! Thanks for this extremely helpful review. How would you compare the Escalante to the Zante V3? They seem to be in the same class and aim for a similar running demographic. Thanks! I ran them back to back as well as with a Zante on one foot and an Escalante on the other. So, I'd say that the Escalante is softer, more of a slipper-like feel and feels like 'less' shoe both in the upper and underfoot. The Zante is especially noticeable under the arch. The Zante feels more like a traditional trainer and the Escalante a bit more minimal, yet still protective under the forefoot. Great review - thank you guys. Given your experience, would this be your favorite shoe to run the Boston Marathon, or the Hoka Clayton or Adidas Adios boost would be more responsive and with a better toe-off for speed? @Sam, thanks for your quick answer! This will be my 6th marathon and my 4th consecutive Boston, shooting for my PR, 3:13. I'm over 50, hence like you I can't go minimalist. Funny you mention the Boost, two years ago I evaluated the Energy Boost and the Hoka Clifton (https://youtu.be/bCKhanh8wP0) and opted for the Clifton. Last year I ran in the Adios 3. I'll check the Adidas Boston 5 and Nike Zoom Elite 9 (salomon on the road ... hhmmm). My escalantes stink really bad, any one else notice this? Awesome review gents! How would you compare the Escalante to the Clifton? I love my Hoka's but am intrigued by Altra's. If not the Escalante which Altra shoe compares closest with the ride of the clifton? I've bruised metatarsals multiple times and my feet just don't agree with firmer/lower stack shoes. Also, any idea on the durability of Altra in general compared to Hoka? Hi Chi, Chiming in. The next step up in cushion in the Altra line would be the Torin. 5mm more cushion heel and forefoot. A great road shoe which will remind you of a livelier Clifton. It is very versatile as if trails aren't slick it can be a great trail runner. The Torin 2.5 upper is snugger and more supportive than the Escalante. 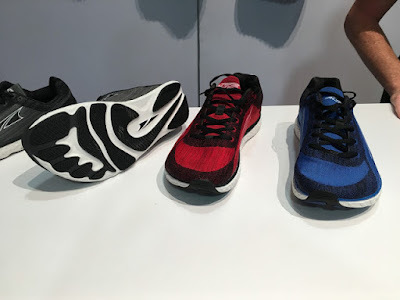 Our review here http://www.roadtrailrun.com/2016/07/review-altra-running-torin-25-altra.html . The Torin 3.0 is just now coming to market and should have a bit more relaxed upper. As far as durability it depends on the models. 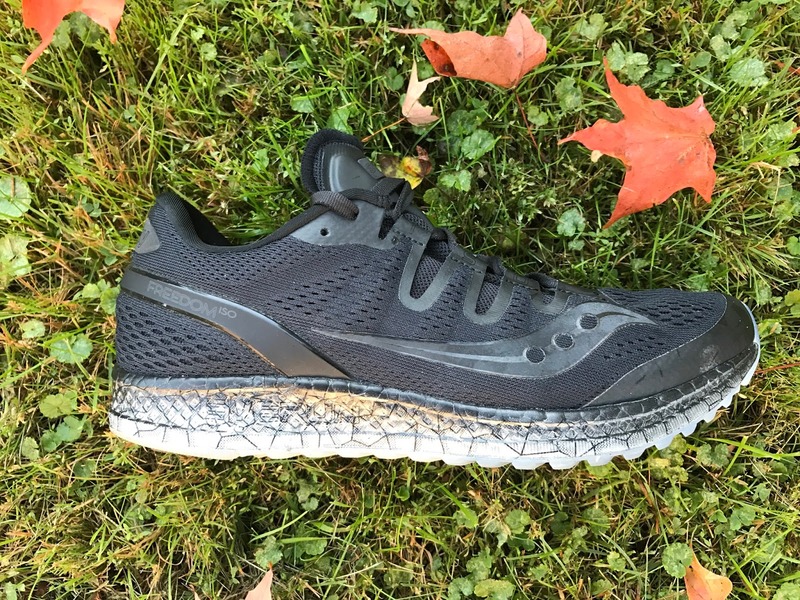 Altra is increasingly adding more outsole rubber. You might also look at the Clayton 2. Somewhat firmer and more responsive than the Clifton with same 28 mm heel/ 24 mm forefoot. Sam, Editor. Thanks Sam! I tried the Clayton 1 and didn't like the bump, even after putting 60 miles on them they made my arches sore. Think I'll try the Torin. Thanks again! Love your reviews. Just to let you know that I got a second pair of escalantes recently and they are différent to my first pair. Although it is still marketed as an escalante 1.0, the shoe has a more structured upper and is slighlty heavier. The tongue is also partly attached to the upper. Still a fantastic shoe! But altra haven't named 1.5 as they usually do. Hi guys. Great review of a great shoe. I've just written a review of the Escalante after a year of use and nearly 2000km. I found the durability quite good, even thoungh I've seen a few people complain about it. I hope people find it useful.